Part of Falke’s ‘Denim Addicted’ collection of jeans-coordinating designs, these ladies Falke Tweedy Denim Check Cotton Socks feature an attractively detailed small pattern and gathered net cuff. If your personal style is denim-allergic don't, worry though - these lovely socks really don't need to be worn with any other denim elements. 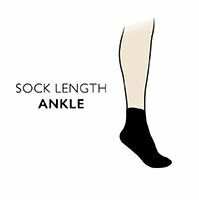 The fine gauge cotton rich socks are light, made with slightly more densely woven contrast toes and heels for added strength and finished with flat, comfortable hand linked toes for smooth seams.